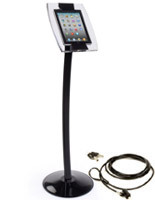 Have you been trying to find iPad stands without locking enclosures that allow easy access to tablets for commercial, institutional, or private use? Podiums2go.com offers a wide selection of freestanding adjustable height and tall tablet holders designed for environments and situations where locking enclosures are not required. 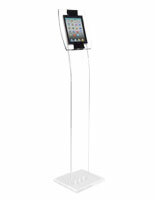 These full size iPad stands for commercial, professional, and private use are available in a variety of styles, sizes, and configurations to ensure device and case compatibility with a full range of handheld devices. Simple enclosures allow a single kiosk to accommodate Apple and Android devices, while others can support everything from Minis and smartphones to larger e-readers and commercial size electronic displays. 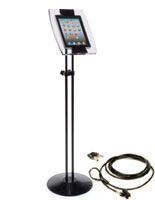 Floor standing iPad stands, also known as adjustable or tall tablet holders, offer simple device installation and removal, making these fixtures a great choice for use in facilities and operations where users provide their own tablets. No matter the size or style, these floorstanding handheld accessories are a great match for commercial and professional use as well as in educational or relgious facilities. Look no further than these tablet holders for Apple iPads and Samsung or Android tablets! We carry several models and designs that fit all your electronic device needs. If you need accessories for trade shows, retail locations or even your home office, we’re sure to have the unit for you. 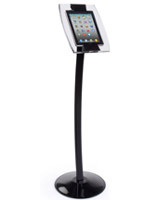 iPad stands, commonly known as tablet holders, are the ideal way to not only protect your device but also allow customers and guest use of its apps and services. We know that durability and stability are extra important, particularly in high-traffic areas. That is why all of our enclosures are crafted from high-quality materials like aluminum and metal. The floor-standing design requires little real estate in any setting while providing an ultra -sturdy platform for your tablet. These iPad holders also have several great features that are specially crafted to protect your tablet. 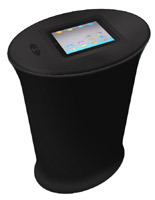 Where can free-access tablet holder displays be used most effectively? 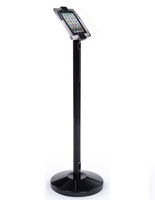 Tall iPad stands are an economical alternative to traditional full size podiums or lecterns. 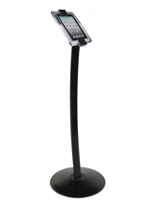 This type of simple reading stand allows users to easily insert their own devices for holding speech or sermon notes, presentation support materials, or class lesson plans. 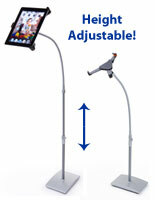 Adjustable height tablet holders come in many configurations, allowing one fixture to accomodate many different users. 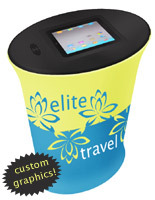 This makes this type of Apple or Android display a great choice for conference, trade show, or educational facilities. 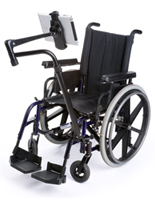 Most portable stands offer the same usability features as floor models, allowing installed devices to rotate, tilt and swivel as needed for accessibility. In addition, Home button functions offer a variety of usage options, from blocking access completely to allowing optional use when desired, to full and open access. Tripod-base adjustable e-book mounts, holders and stands offer hands-free use of installed devices, making them a perfect choice for use as reading stands, sermon stands or ministry pulpits, and music stands. 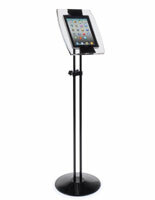 Tall tablet stands with swing arms allow screens tilt, rotate and swivel as needed. This flexibility makes these economical handheld device stands a great choice for operations that require multiple users at one time. Flexible display options allow customers and staff, teachers and students to alternate use, or for clients to have private entry options for personal information. Businesses, facilities, offices, churches, hospitals, and schools may not always require that tablets be installed in maximum security enclosures. Many operations allow users to bring their own Apple or Android devices for use as portable workstations, and simple tablet holder brackets allow staff to quickly access hands-free functionality as needed. 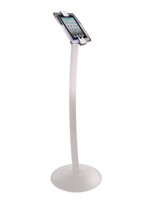 Adjustable height options allow tall fixtures to accommodate a full range of users. In addition, variable usability options such as blocked or free-use access to Home button functions make this type of non-locking handheld device enclosure a great choice for facilities that require one single freestanding holder to serve many different users and purposes.